Much less wellknown than Kumbu, the Tibetan side of Everest is fascinating for its vast spaces and the mountains which rise eight thousand metres above the Tibetan steppes. The trip starts at Tingrit and after two days of walking we reach the base of Everest (5,200 metres) where we spend a couple of days acclimatizing. The climb to A.B.C. consists of two days walking up the Rongbuk glacier to an intermediate base camp (I.C.) at 5,800 metres. 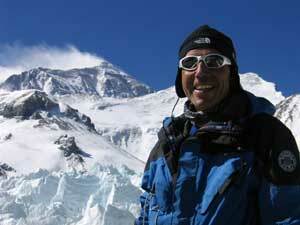 Visiting Everest at 6,400 metres makes all the effort and discomfort of reaching this height worthwhile. For those who are particularly adventurous and fit, we can attempt to climb from the camp to reach the northern pass. The feelings and emotions will remain with us for a long time. Words really are inadequate to describe this experience. Equipment : For high altitude trekking.